This five-part suite stands for lifestyle, fun, and emotion, and incorporates blues, jazz, gospel, and soul. The compositions encourage both ensemble and solo playing since every part presents one of the musicians of the quintet as a soloist. The solos are written in the style of famous saxophonists (Sonny Rollins, Dexter Gordon, Charlie Parker, Dave Sanborn) and can be used by the individual musicians as a basis to create their own improvisations. For advanced students, but also for students at music colleges and professional musicians who wish to enrich their repertory with groovy and gripping jazz tunes. 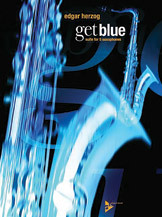 The free improvisation parts are suitable for every level of difficulty. Titles: I. Count Peanuts * II. West Side Blue * III. Box E * IV. Blue Spirit * V. 3 for 5.